How do I serialize custom tick placement and labels, generated by TickProviderAPI and LabelProvider? Actually, the main problem is that I need to export high quality (i.e. 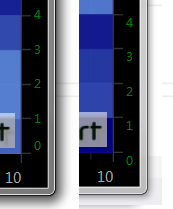 higher than actual figure size on screen) PNG images in MVVM application and method ExportToFile(fileName, ExportType.Png, false, new Size(…, …)) produces axis ticks and labels as if they were controled by original MinorDelta and MajorDelta parameters. ExportToFile() without size parameter produces output correctly, so that must be due to not-serialized TickProvider and LabeProvider properties (? ), which in exported serialized surface string does not exist. I am using the 2D Heatmap with text as my working prototype. I wish to have a secondary Axis on the opposite side of my man Axis that displays a count for that row or column. To display this information is simple enough through using the LabelProvider (although two lines maybe a bit tricky), and I can do some stuff with the TickProvider when it gets a bit too busy. My question is on how I can position these TickLabels to be in the center of a row/column? My first thought was I could be cheeky and set the margin value to offset it in its style but it seems it only works so far with the TickLabel just displayed below the tick. What I am trying to achieve seems to be the default positioning for column charts, and histograms. I was wondering if there is a behind the scenes option or an override I’ve missed to set this? Alternatively annotations maybe the way to go but I get the impression that this is more for on chart labels rather than for Axis? p.s. I think when dealing with multiple Axes, you should give an warning/error if an “Id” is not given to secondary Axis as the graph will just show blank. I want to change the major tick of a CategoryDateTimeAxis. I saw “Advanced Tick Frequency Overriding”. I tried to extends CategoryTickCoordinatesProvider class but I think that shouldn’t be work. So how should I do? Different SciChartSurface area color between definite values. I would like to paint SciChartSurface between definite X values with another color. Please see attached screenshot (grey area). Is there easy and perfomance cost efficient way to do it? Now I just use TickProvider to draw 2 lines as borders of the area. I’m trying to use LogarithmicNumericAxis for y-axis. But when chart has a small range of values (for a example, from 32 to 41) the axis became a empty.